Annually, a coalition of partners come together to demonstrate the importance of water. Our Water Festivals are held in the spring of each year at a public venue. The target audience is the general public and our own water users. Information is distributed through brochures and handouts. Displays are presented and workshops are held. 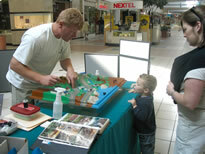 Fun, hands-on water activities are available for the all in attendance.